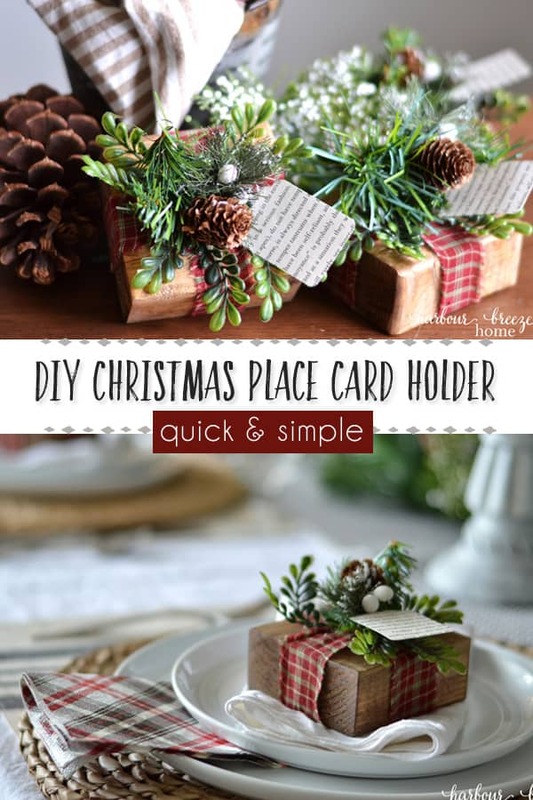 In this article: Learn the simple steps to make DIY Christmas place card holders. 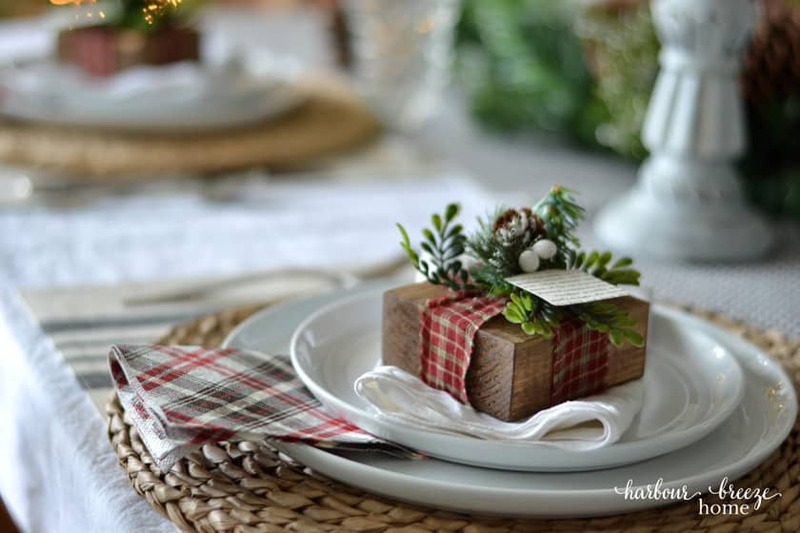 They’re budget friendly, quick to make, and add some of that Joanna Gaines’ farmhouse style to your Christmas table. I didn’t set out with a theme for my Christmas decor this year. It just happened. that look like presents! ;) Whether I set out with it or not, gifts are my Christmas theme this year! 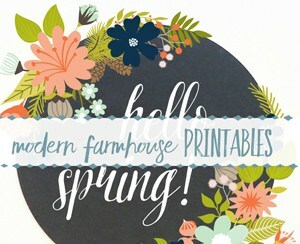 This is another project that will help use up those leftover 2×4 ends that are just sitting un-used in your garage ~ and it’s super quick to make! I used the same method of wiping on stain with a foam brush and wiping off with a rag as I showed here. Stain all sides of each block. Wrap 2 ribbon pieces (or fabric strips) up from the bottom and glue in to the center of the top with the glue gun. *Tip: When you use a hot glue gun, apply the glue, WAIT a few seconds, and then place item you are gluing. 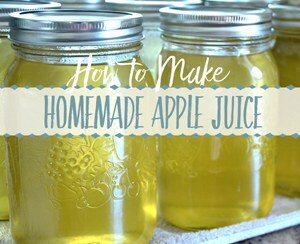 It will spare you from burning your fingers over and over! 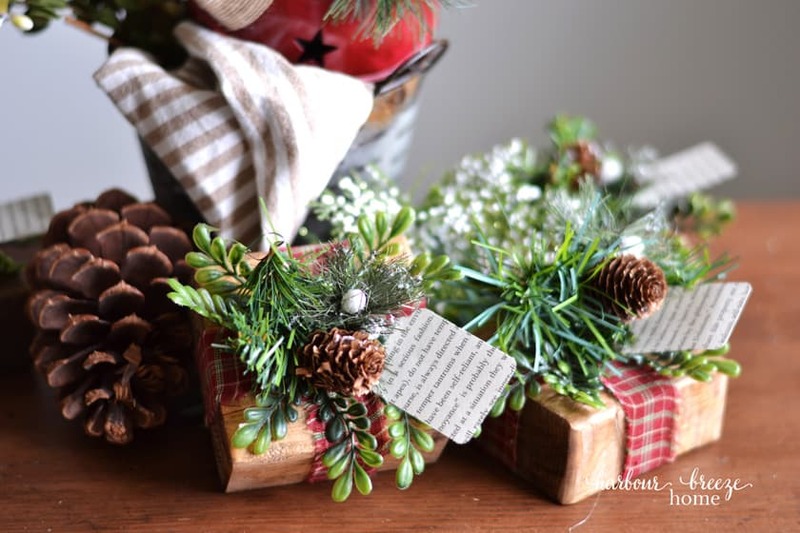 Using the hot glue gun, glue down layers of faux greenery, ending with your “accessory” items ~ like pine cones, faux berries, or jingle bells. *Tip: I used some old plastic faux greenery as my very bottom layer and then added more realistic looking greenery on top. 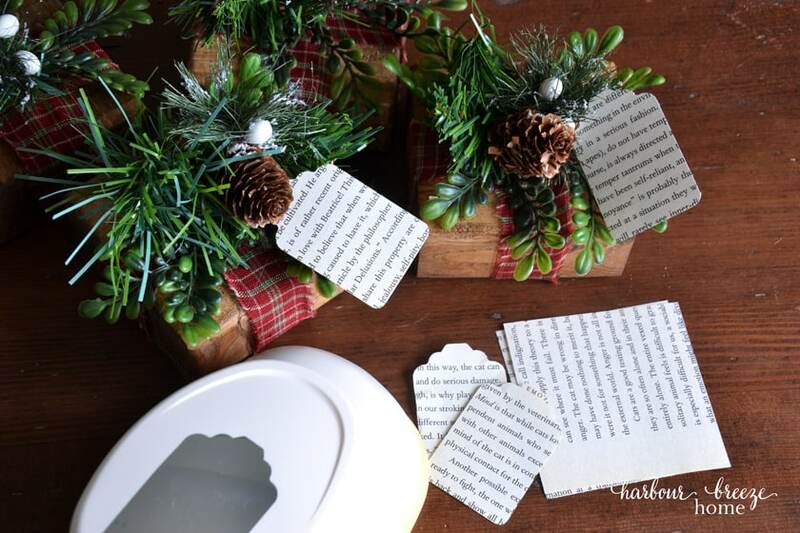 Using a paper tag punch, punch out name tags and tuck under the greenery. I used old book pages, but cardstock would work well, too. 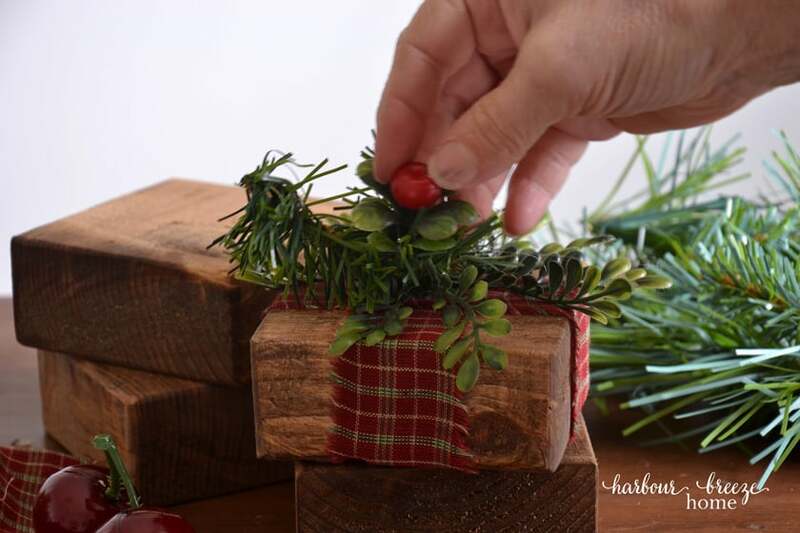 *Tip: If you’d like to add even more decoration, you could punch a hole in the top of the name tags and tie them onto the greenery with jute or baker’s twine. 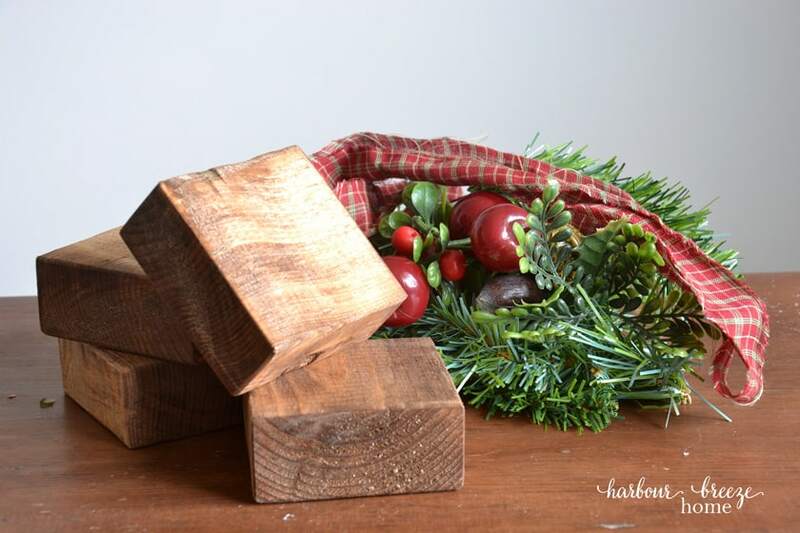 Instead of staining the wood block, you could paint it any color you’d like, and coordinate with different ribbon. A white “gift” with sparkly ribbon would make an elegant look rather than a rustic one. If you wanted to set these present place card settings by each guests’ drinking glass, you could do a fun folded napkin option as well ~ like this Christmas tree folded napkin, or this one folded like a pocket for silverware. 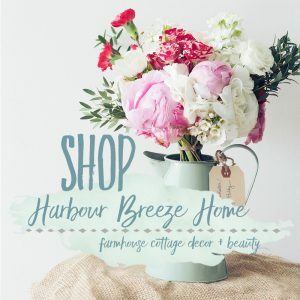 If you’re looking for some basic table setting items, here is a list of Farmhouse Table Decor items inspired by Joanna Gaines herself. Those are really pretty! 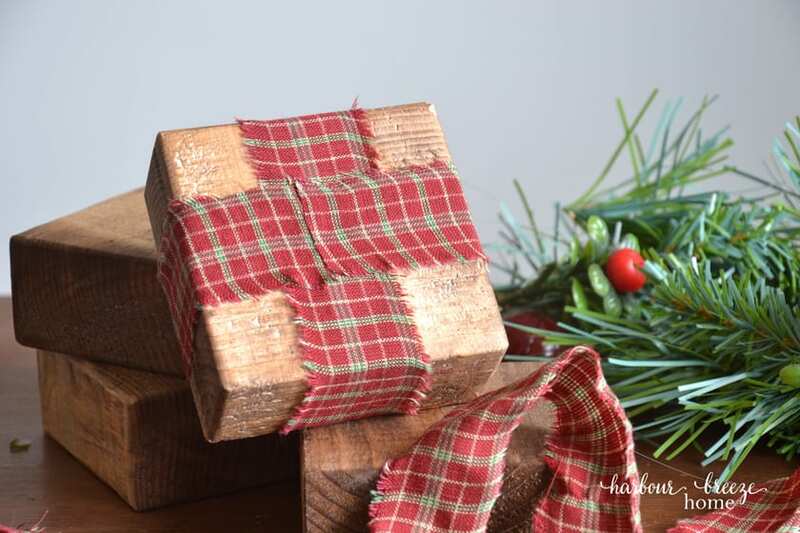 I love the plaid ribbon with the rustic wood. I specially like the square shape and the way it sits on the round table setting. Beautiful. I LUV this idea. thank you for sharing.